The 80 Sofa with Rolled Arms and Tapered Wood Feet by Lancer at Town and Country Furniture in the Hamburg, Buffalo, Lackawanna, Eden, NY area. Product availability may vary. Contact us for the most current availability on this product. Fabric Options Many fabric options available by custom special order. Frame Construction Frames are inner-locked and glued with corner blocks and feature built-in legs where the design is appropriate. Seat Support Each coil is produced of high-carbon spring wire & tempered to provide long lasting durability. Each unit has 9-gauge high-carbon, tempered wire support system. Coils are attached to each other & secured w/ a perimeter coil for a unitized seating surface. The 80 series collection offers a transitional collection for your home that incorporates the classic appeal of rolled arms with more casual elements, such as the tapered wood feet. Shown in Wild One Sisal fabric, this is just one of the many options available for this comfortable sofa and chair. With a special order you can pick out the perfect fabric for your home's living room and create a fantastic place to gather with friends and family. Coordinating pieces also available (not shown) are a loveseat, Queen sleeper sofa, and ottoman. 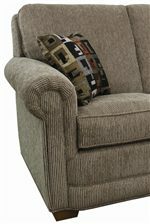 The 80 collection is a great option if you are looking for Casual furniture in the Hamburg, Buffalo, Lackawanna, Eden, NY area. Browse other items in the 80 collection from Town and Country Furniture in the Hamburg, Buffalo, Lackawanna, Eden, NY area.